WASHINGTON (CNS) — Fifty years ago, the Rev. Martin Luther King Jr. took a group of white Alabama clergymen to task for suggesting he find ways, other than demonstrations and protests, to seek racial equality. Rev. King, held in solitary confinement for eight days for violating the city’s ban on civil rights demonstrations, began his response to the clergymen April 16, the fourth day of his prison sentence. He used a pencil to write on margins of a newspaper and slips of paper, and he only wrote during the day since his cell had no overhead light. The letter, addressed to “My Dear Fellow Clergymen” became the famous “Letter from Birmingham Jail.” Pieces of it were smuggled out with his attorneys and an associate compiled them and gave them to Rev. King’s secretary to type. The 21-page letter was never sent to the religious leaders; they saw it when everyone else did, published in part in newspapers and magazines May 19, 1963. In the letter, Rev. King explained why he felt compelled to participate in demonstrations, marches and nonviolent actions. He told Catholic News Service April 15 that the letter was meant for a much broader audience than just these eight religious leaders but, since he wrote to them as a minister, it has deeply spiritual themes. “Those who read this through a nonspiritual lens miss a lot of these truths,” he added. 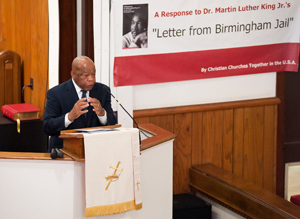 For the letter’s 50th anniversary, public readings of the letter are taking place not only in Birmingham, but across the United States and in places around the world. Religious figures in particular are not just reading the letter but responding to it. 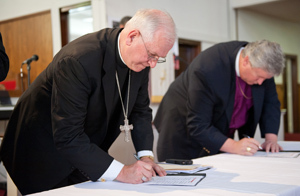 Leaders of U.S. Christian denominations who are part of the ecumenical organization Christian Churches Together gathered in Birmingham April 14-15 to sign a response to the letter and discuss its meaning then and now. 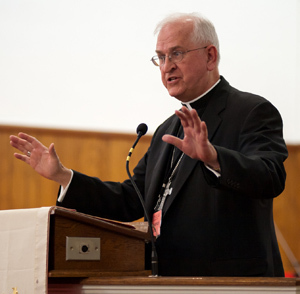 In a telephone interview before the two-day gathering in Birmingham, the archbishop told CNS that when he reread Rev. King’s letter he “recognized not just what a classic it is, but how touching it is to uncover the soul of someone seriously trying to follow Christ” and trying to move people to action. Bass said the events of 1963, not just Rev. King’s letter, had an impact on the bishop and changed his views. After Rev. King’s assassination in Memphis, Tenn., in 1968, Bishop Durick walked in the front ranks of a civil rights march. He marched again the following year in a tribute to the slain civil rights leader. 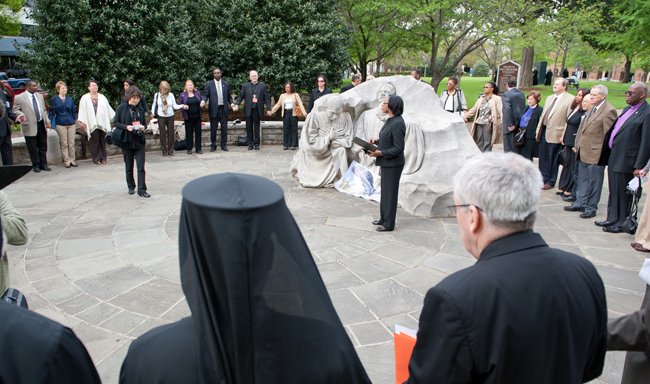 Activities included a morning prayer walk April 15 at Kelly Ingram Park. Those gathered for it were split into two groups, each following a path marking the routes of civil rights marches. The two groups then rejoined and participants held hands and prayed at the “Kneeling Ministers” sculpture. The statue depicts the Revs. John Thomas Porter, Nelson H. Smith and A. D. King, kneeling in prayer after being confronted by Public Safety Commissioner Bull Connor during an April 7, 1963, protest. Rev. A.D. King was the brother of Rev. Martin Luther King. Contributing to this story was Mary Dillard in Birmingham. She is on the staff of One Voice, the newspaper of the Birmingham Diocese.